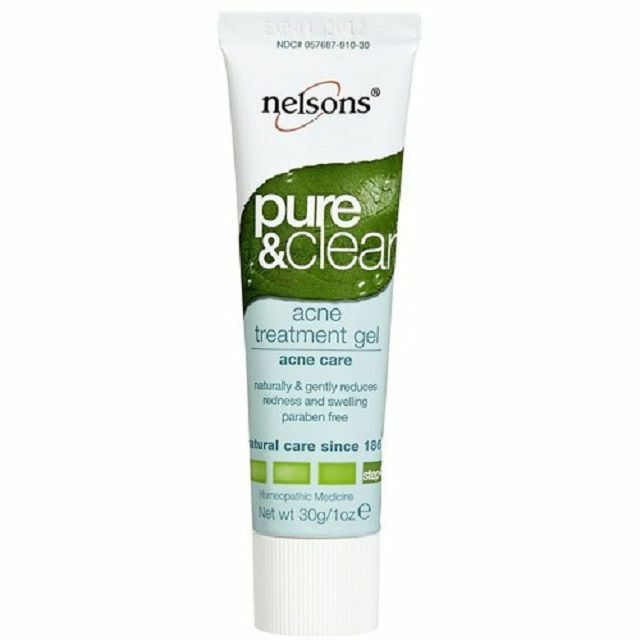 Nelsons Pure and Clear Acne Treatment Gel is an over-the-counter acne spot treatment, used to treat redness and swelling of existing breakouts. Dab it on individual pimples to help soothe and heal. It won't work on deep nodules or cystic breakouts, but it can help smaller pimples. Also, this product isn't meant to clear up a case of acne. This spot treatment is part of the Nelson's Pure and Clear four-step acne care system, and can be purchased individually as well. You can find this product at Whole Foods Market, big box stores like Walmart and Target, and various online retailers. Who among us doesn't have an acne spot treatment or two in the bathroom cabinet? Currently, I have three taking up space in my medicine cabinet. But there is always room for one more, so I've been using the Pure and Clear Acne Treatment Gel regularly. As far as spot treatments go, I rather like it. I also liked that I felt a distinctly cooling effect when I applied it. It feels really nice on those inflamed pimples although the cool feeling didn't last nearly long enough. The price isn't bad, either, at just under $11 for a 1-ounce tube. And this tube will last you quite a while. In fact, a tiny squeeze of the tube gave more than enough product to dab on all my active pimples, plus a little to spare. Word of warning, though. When I opened the spot treatment for the very first time, quite a bit of product oozed out. Be careful not to squeeze the tube as I did. The ingredients seemed sensible. Arnica has been used to treat swelling and inflammation. Calendula and St. John's wort are old folk remedies for irritated skin. Sulfur and tea tree oil are often incorporated into acne treatment products. They have drying and antimicrobial properties. As far as the results I got with this spot treatment, they were mixed. Sometimes, it seemed to work great. Other times, not so much. Still, I think I liked this one better than most spot treatments I've tried. Although it didn't always help the pimple heal more quickly, it did seem to cut down on the amount of redness and swelling so I was at least able to cover it more easily. Another plus -- makeup goes over this spot treatment smoothly. I credit the light, water-based gel for this. It spreads easily, absorbs quickly and feels light on the skin. You can't even tell it's there. This is one spot treatment I'm going to keep purchasing. Although it lasts so long, it will take me a while to finish the first tube!